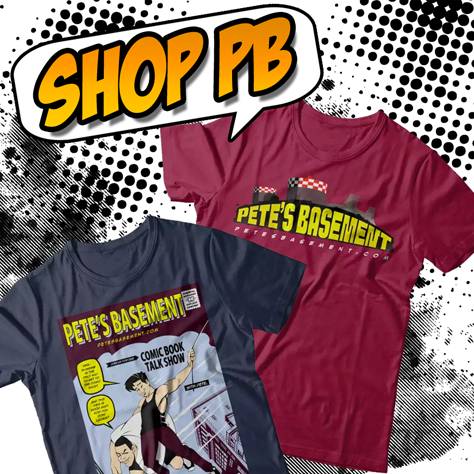 Ramon and Pete have some new blood in the Basement this week! Rocket Man Chris returns to the roundtable with his friend and Sensei, John. Its time to (FINALLY!) talk The Big Bad in Batman Eternal! It definitely wasn't who the Basement Boys were expecting...until the end of course. What do we mean? You'll just have to watch! This week also brings you in depth discussions about dinosaur bung holes! Someone please get the acid proof toilet paper for the cast of Past Aways. Transformers: Combiner Wars throws together a bunch of your favorite bots -- yes, that pun was totally on purpose, and you loved it! Also up for talk is why Disney is turning its rides and attractions into comic books, as the boys read through Big Thunder Mountain Railroad. A bunch more books, and of course viewer mail! Also a contest winner AND a special edition t-shirt offer! Hit the download button!